An Immersion Tour of Greece! 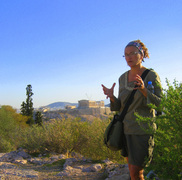 Join your two guides, Manolis & Patricia on this twelve-day journey of the highlights of Greece. Starting in Athens, the birthplace of democracy and ending on the breathtaking island of Santorini -truly a trip to remember. "I have done several tours with Patricia & Manolis, and every trip was more incredible than the one before. 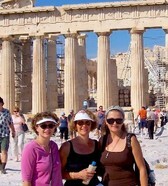 My last tour with them was Italy/Greece, and I will be signing up again on their next trip to Greece. The sites were truly breathtaking, and the people and food were spectacular. Touring with Patricia & Manolis is the only way to go if you want your trip to be experience of a lifetime." Welcome to Athens, the birthplace of democracy. In this famous city our journey begins. Our hotel is located near the New Acropolis Museum, rated one of the finest museums in the world (including awards for its unique architecture) with spectacular views of the Acropolis and the Parthenon. You owe it to yourself to take your time visiting the museum and then make your way back to our hotel to sit and gaze up at the Acropolis from the roof-top bar. Leave some time for a short rest before joining us later for a drink and introductions. We have planned a special first night dinner at a nearby taverna. ​Includes-Welcome Drink/ The New Acropolis Museum/ Dinner together/ Hotel with Acropolis view from Roof-top bar and Jacuzzi/UNESCO World Heritage Site (Acropolis)/Overnight Athens. We are up early this morning as we take a walk in the rolling grounds surrounding the Acropolis. We will make our way up to the "historic rock” to take in a wonder of ancient architecture, the Parthenon, a UNESCO World Heritage Site. Take all the time you need to explore this monument dating from 447 B.C., including sweeping views of Athens. We will walk together through the Ancient Agora and end up in the winding streets of Monastiraki, one of the oldest markets of Athens. Lunch is on your own, but we can recommend some of the best souvlaki that Athens has to offer. In the afternoon, we will shuttle down to the port and board our ferry for the island of Poros, a very well preserved island full of neoclassical houses. After checking into our hotel, we will offer an optional walk exploring the beautiful seaside town. 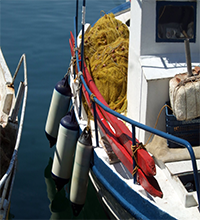 Dinner will be together at a traditional island taverna, well known to the locals. Swim opportunity-taxi ride to the beach for an afternoon swim. Includes-Breakfast/Entrance fee Acropolis & Agora/ Walk/ Private Transport to Ferry/ Ferry to Poros Island/ Walk/ Dinner together/ UNESCO World Heritage Site (Acropolis). No need to pack your bags, as we will leave after breakfast, by hydrofoil for a day trip to the lovely island of Hydra. There are no roads and no cars on Hydra, which has enabled this island to maintain its traditional character, with neoclassical houses amphitheater-like, sweeping up and around the port. A walk is in order as we take in the highlights this island has to offer, including a tour of the traditional 'captain's house'. We will have lunch together sampling the local fare. We are back on board our ferry in the afternoon to return to Poros. Dinner is on your own with plenty of recommendations from us. Swim Opportunity-Pack swimwear for nearby beach on Hydra. 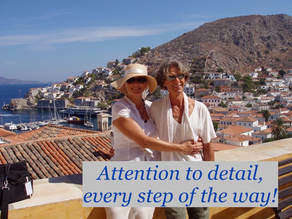 Includes-Breakfast/Walking Tour of Hydra/ Entrance Fee and Tour of Traditional Captains House/ Lunch/ Ferry to and From Hydra/ Overnight Island of Poros. After breakfast we have a short ferry ride to another island, the 'island Pelops' otherwise known as the Peloponnese. We head inland to the heart of this large 'island' and the famous ancient theatre and healing center of Epidaurus. It is here where many of the greatest singers of all time have performed, including Maria Callas. Still today, there are ancient Greek plays performed during the summer festivals. Make sure you have a song to sing or a poem to recite so that you too can perform at this fantastic site. After taking our time absorbing the museum and ruins, we are off to the town of Naufplio, once the capital of Greece, and still one of the most preserved neo-classical towns. ​After we check in, you can climb the 990 steps to the fort at AcroNaufplio for breathtaking views of the gulf, go for a swim at a nearby beach, or sit in the main square sipping a beer while you watch the locals. Either way, we will be on hand to facilitate your exploration plus point out the best gelato place around. We'll enjoy dinner together at one of our favorite taverna amidst the cobblestone streets of this lovely town. Includes-Breakfast/ Private Transportation/ Entrance Fee and Visit to Epidaurus and the Sanctuary of Aesculapius / Dinner together/ UNESCO World Heritage Site/ Overnight Naufplio. Reserve your spot on this tour! 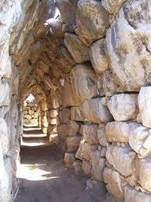 Today we visit Mycenae, the mythical home of King Agamemnon and Clytemnestra. It was here where the explorer Heinrich Schliemann believed he had found the mask of Agamemnon. The approach takes us through low lying hills and valleys studded with shinning olive groves- but once there, beehive tombs and cyclopean walls await us. After touring the grounds and the museum, we will make our way to Nemea, where Hercules was put to one of his labors, slaying the Nemean Lion. We will tour the grounds, which once held games that rivaled those at Olympia. Afterward we will stop at an award winning winery to taste test their best wines. We will tour their vineyards, and enjoy a light lunch on the grounds. In the afternoon, we will return to Naufplio where dinner will be on your own, but first join us in the courtyard of our hotel for a wine tasting of some of the best regional wines that Greece has to offer. New trip! Ecuador and the Galapagos Islands November 2019 Tap here! ​We are off the the auspicious fortress at AcroCorinth and the area in which St. Paul wrote his letter to the Corinthians. Views across the mainland and blue waters of the Gulf of Corinth await us as we take our time visiting this archaeological site where it is surrounded by walls measuring over 2 kilometers. We will have a stop to look over the famed Corinth Canal to take in this feat of engineering, before lunch on. The evening finds us back in Athens for an overnight stay before we hit the seas and our Cycladic island adventure. After breakfast we shuttle to the port of Piraeus (Athens Port) to 'set sail' on the Aegean sea and make our way to the Cycladic islands. We will take our time as we pass by islands in the distance and take in the never-ending blue sea and sky. You can have lunch will be on board, with a range of choices, as we cruise the Aegean. We are off to the island of Antiparos by way of Paros, to our seaside lodge. Here is the time to unwind and enjoy this peaceful seaside location. Take your time swimming or kayaking. Dinner together at a local taverna with island specialties. Ask us a question- email us right now! This morning we are off for our tour of the island of Paros. Paros is one of the most iconic island of the Cycladic island chain. Parian marble was used in some of the finest ancient sculptures including the Medici Venus (Uffizi, Florence) and the Nike of Samothrace (Louvre, Paris). We will be visiting the marble mines and also stopping at mountain villages. We will pick a village on the seaside for a taverna lunch on your own. Join us in the morning as we visit the cave of Antiparos. At 85 meters (275 feet) it is its own natural museum with some of the oldest stalactites and stalagmites in Europe estimated to be 45 million years old. After our morning tour we leave by private launch for the uninhabited island of Despotiko*. The Greek State Archaeological Service is conducting digs on the island and we will give you a synopsis of recent finds that date from the 7th century BC. Take your swimming gear with you as you will have an opportunity to swim in the crystal clear waters. Afterward we will have a picnic on the beach together. Later in the afternoon we will return to our seaside hotel and you will have plenty of time to relax, pick up a book or enjoy a coffee. Join us later for a Greek cooking lesson. We will learn how to make several Greek mezedes (appetizers) that you can make for friends and family when you return home. We will also enjoy what we just made before dinner on your own at any number of spots nearby. *weather permitting-we might change the launch to later or earlier in the day due to weather. After breakfast we will pack our bags and ready ourselves for our ferry to Santorini, one of the most singular places in all of the Aegean. Whitewashed houses sit clinging to the rim of the caldera, left after the large volcanic eruption of BC 1650. After checking our bags at our caldera-view hotel, we will lead a walk into town, along winding paths and make our way to the Prehistoric Museum in Fira. Here we will see explore the finds discovered at the site of Akrotiri, some dating 1000 years before the Parthenon. We will learn of the ancient civilization that once lived here; which some people think was the lost City of Atlantis. We will point out some tavernas for a great dinner on your own. Later you can enjoy a drink in dreamy bars overlooking the caldera. ​Enjoy a leisurely breakfast as you look out over the blue sea and islands in the distance. We will offer two options to further explore this magnificent island. Either a shopping tour of the two main villages on the island or a breathtaking walk along the caldera. Lunch on your own at any one of the cafes in town. In the evening meet us back at the hotel where we will celebrate our trip with a special farewell dinner at one of our favorite tavernas. Includes-Breakfast/ Shopping Tour/ Caldera Walk/ The Village of Oia/ Dinner/ Overnight Santorini. Our trip ends on the Island of Santorini, and what a special place to end it on. You have many options; stay on a little while longer, explore more of the Cycladic islands or return to Athens for some more visiting of that great city. Either way we bid you Kalo-Taxidi (have a good trip in Greek)! Two bi-cultural & bi-lingual guides who live here! -Prices are per person which includes all of the above mentioned in the itinerary and is based on double occupancy. Single room rate is $825 per person extra added to the cost of the trip. A deposit of $400 holds a spot on this tour. A remaining deposit of $600 will be due by June 1st 2019. Final payment is due June 25 2019. Until final payment is paid all deposits are fully refundable.